People often ask me, what is one thing that they can do to affect the most change in their lives – it has to be short, simple and easy. My answer is “breathe.” The average person breathes anywhere from 12 – 18 breaths a minute. That is one breath every 5 – 3 seconds (respectively). When I get out my watch and time myself at 1 breath every 3 seconds I feel like a rabbit, or like I am doing a kriya (a cleansing practice). After about a minute I start to feel antsy and anxious. Time yourself and try it, right now. I’ll wait. Seems a bit quick, yes? On the flip side, in preparation for meditation, we may breathe 1 breath every 15 – 25 seconds. It may take 5 breaths to settle into that rhythm but after a minute or so you begin to feel very relaxed and tasks like writing this into hold less interest as I want to dive into meditation. Feel free to try it right now. Just remember to come back and read the rest of this. Feeling nice and relaxed? With these two ends of the spectrum, we can create very different outcomes in the mind and body. But there also needs to be a happy medium. And there is. Try 1 breath every 12 seconds, 5 – 6 breaths per minute. This is known as Coherent Breathing (you can read more about it in The Healing Power of the Breath by Drs Brown and Gerbarg, reviewed below). You can breathe this way anywhere, anytime. Reading about the breath is interesting and some of you may pick up breathing practices this way. But the best and most effective way to learn breathing techniques, their effects and contraindications, is with a qualified instructor. 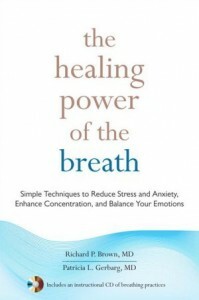 Drs Brown and Gerbarg are two amazing doctors and researchers that study the breath. For years they worked with Sudharshan Kriya – a practice taught by Sri Sri Ravi Shankar. Now they are proponents of the Coherent Breathing Technique, or 5-6 breaths per minute. The Healing Power of the Breath, demonstrates that less can be so much more when it comes to healing yourself. Using these techniques can activate your own healing powers without the side-effects of many medications. The purpose of this book is to give simple techniques that anyone can do, anywhere and anytime. Practices are best when they are accessible at all times. It is wonderful to be able to do a breathing practice that balances your nervous system while you are working on your computer. While it may take you some time to practice without the guidance of the CD, once you have the rhythm, you can use it anywhere. The suggestion in the introduction of this book is that you read a chapter and practice that technique with the CD in the back of the book of a couple of days. Then move on to the next chapter/technique. Each chapter builds on the previous, building to a total breath. Drs Brown and Gerbarg also provide research as well as anecdotes of how each of the techniques work. On a personal note – I had the joy of learning this technique from Drs Brown and Gerbarg several years ago. It is a practice I love because I can do it while I am reading, or right now as I am writing this. If you are in Tucson, you can experience this practice with me during my Thursday class, 10am at Arizona Oncology. I teach it in my other classes, but not on a regular basis.